Following on from dragons and skulls, the third work in the collection by Daniel Strom is somewhat more restrained – or at least its form is less provocative – with angels adorning the sculpted case. 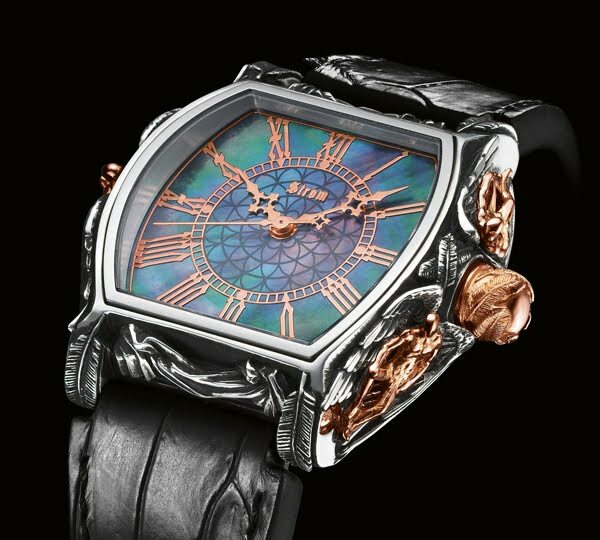 A creation into which the watchmaker has breathed all the spirit of AGONIUM – watches that do not simply tell the time, but also express our existential questions ; a creation that highlights his reflections and gives great symbolic significance to time. And angels are undoubtedly the quintessential symbol of the spiritual order: winged messengers, beings of light, imbued with divine functions, to whom we willingly attribute the role of protector. Ever-present in the imagination, they embody the bridge between the material and symbolic worlds, God and His creatures. A force that directly raises the question of our origins, a force whose invisible presence is only rarely materialised – something now achieved with “Angelus”. And Daniel Strom certainly has an eye for detail. The sculptor works with materials and enhances their nobility. Plated onto an original mould, gold, silver, platinum and palladium are crafted by the expert strokes of the goldsmith, giving rise to unique pieces. The case of the “Angelus” is embellished with a wealth of details, curves, incisions and finishes. Feathers twirl around the crown – a symbol reflected on the lugs. The two sides of the case feature two reclining angels and a crouching messenger, wings spread out as if ready to fly. Behind the anti-reflective, domed sapphire crystal, the white or dark mother-of-pearl dial plays with contrasts with the Roman numerals and golden, polished hands. Like the Memento Mori or Draco, three hands count the hours, minutes and seconds. At the heart of the timepiece, a second case surrounds the automatic ETA 2824 movement. A whole host of details that endow “Angelus” with its full metaphorical depth.